Endowed with an extensive application realm ranging from oil and gas, pharmaceuticals, food & beverages, and automotive, liquid nitrogen market has been relentlessly expanding over the last few years. The overall remuneration scale of the liquid nitrogen industry is likely to surpass USD 17 billion, which is quite unsurprising as the product is being utilized across numerous other industries beyond the traditional end-user business verticals. Moreover, the liquid nitrogen market is gaining ground in the Asia Pacific region given that it is quite a well-established industry in North America and Europe. With greater emphasis on low-impact and cost-effective business practices, numerous industry verticals are engaged in finding new applications so as to transform traditional manufacturing facilities. In this context, it would be prudent to take note of the fact that the on-site production of liquid nitrogen has gained prominence across a number of industrial businesses for running daily operations more efficiently. Elaborating on a few significant benefits of on-site production of liquid nitrogen, it is a highly-sustainable option than relying on bulk supply of liquid or gas delivered in cylinders, which require handling, transportation, and the subsequent high administrative costs. Among the various end-user verticals of liquid nitrogen market, the pharmaceutical sector is one of the major sectors that is increasingly preferring on-site production over other alternatives for it requires continuous and adequate supply of highly pure nitrogen. Leading pharmaceutical companies across the globe are moving away from external suppliers and are increasingly installing on-site nitrogen generators to ensure low operating expenses and reduce the risk of production breakdowns. Laboratorio Sanderson S.A, for instance, has recently installed a state-of-the-art on-site nitrogen generator manufactured by Atlas Copco. Equipped with PSA technology, the new generator would provide Chile’s foremost pharmaceutical firm with liquid nitrogen at a purity between 95 % and 99.999 %, meeting the stringent purity requirements. Apart from the pharmaceutical sector, companies operating across business verticals such as oil and gas, food & beverages, rubber & plastic, and automotive are readily installing on-site nitrogen generators at their manufacturing facilities to bolster the pace of production and reduce operating costs. This has led to significant proliferation of on-site production segment in the past few years and is unsurprisingly forecast to grow at a substantial rate in the times to come. In fact, as per a research report prepared by Global Market Insights, Inc., on-site production apportioned the maximum revenue share across the transportation segment of the liquid nitrogen industry in 2017. How the launch of technologically superior nitrogen generators is changing the facets of liquid nitrogen market? The Swedish industrial firm Atlas Copco recently introduced that it has nine new high-capacity and energy-efficient nitrogen generators to its NGP+ product range. The latest range has the ability to provide on-site nitrogen with purity levels up to 99.999% and flows ranging from 5.2 l/s to 797 l/s. It also cuts down running costs of the manufacturing facility by about 50% which is quite significant. The subsidiary of the Air Products conglomerate, the Spanish industrial gas company Carburos Metálicos has expanded its range of PRISM® generators for the production of on-site nitrogen. The new generators enable in-situ production of nitrogen and provides a purity between 95% and 99.999%. These generators are easy to install and operate, apart from requiring small space as they are compact and modular. 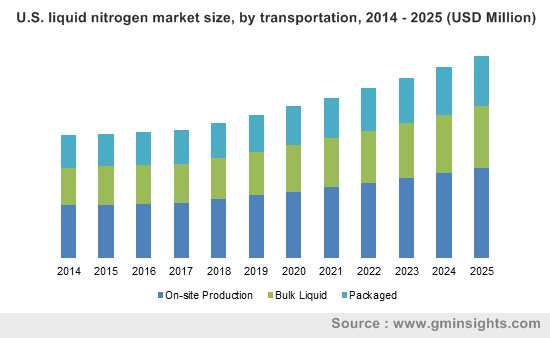 In view of the aforementioned factors, it is quite overt that technologically superior products would undoubtedly contribute to the growth of liquid nitrogen market share in the years ahead. Concurrently, the foremost companies such as Linde Ag, Praxair Inc., Gulf Cryo, Nexair LLC, Messer Group, Air Liquide S.A., Emirates Industrial Gas Co. LLC, Southern Industrial Gas Berhad, and Taiyo Nippon Sanso Corporation are concentrating on product enhancement, essentially boosting the reach of liquid nitrogen market across major business verticals.